An accumulation of magnificent taxidermy, animal hides, sporting art and worn leather furniture adorned the room. He laughed heartily while placing blame for its contents on childhood curiosity and his granddad's hunting magazines. "I went hunting before I had a gun. I traveled the world from a tender age," he confessed. One look around the room verified his honesty, he'd been captivated by the chronicles of wild places. The wise woodsman continued his monologue with a biographical justification for hunting the far reaches of the world, including an account of his first rabbit hunt. A passed-down L. C. Smith shotgun, a beagle's song, and a cottontail had left him a recipient of — call it what you will — passion or wonder. "What do you think of those bosses," he asked while pointing to the fine specimen. "The PH said that brute was one of the best buffalo taken in the area. Sucker tried to charge. The .375 H&H stopped that nonsense." The aged hunter provided a fine mixture of novel and biography. He was the author, his trophy room the book and each mount a chapter. The only thing missing was the publisher — who undoubtedly would have categorized these tales as fiction. Tales of deep snow, warm fires, and camaraderie shared in hunting camp made the term 'trophy room' seem inappropriate — a misnomer. These trophies on the wall were bookmarks carefully placed among the pages of his life story. To the outsider this trophy room might seem conspicuous, even outlandish. The vast number of dead animals on the walls might cause some to question the sanity of their owner. 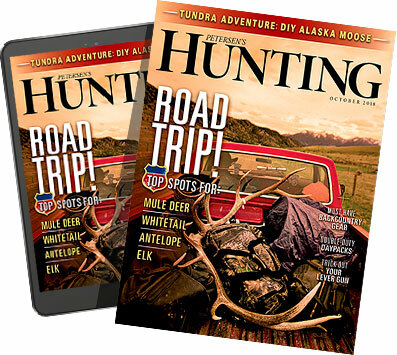 Others might find the stacks of dog-eared, out-of-date hunting magazines slightly odd — or wonder why anyone would decorate with bleached animal skulls. But a hunter would feel at home here. Around the globe we find record of our hunter-gatherer ancestors hanging their trophies on stone, in the form of petroglyphs and pictographs. Anthropologists conclude that etched deep within man's very existence is an innate sense that places value on the preservation and sharing of an experience — especially those accumulated while hunting. Since the Paleolithic era our predecessors understood a solitary hunt is not as it seems, it is more — much more. Each hunt is a journey, an adventure. Each animal pursued had the making of an epic outcome, sure to include either success or failure. Those who preceded us understood a hunt was not to be defined by the single moment when an animal died. To the modern hunter a tape cannot measure, nor record book recite what a mount on the wall represents. Displaying hide, horn and antler is the hunter's only way of exhibiting the very essence of miles traveled, hardships encountered, and memories made. The décor and ambiance found in individual trophy rooms is as diverse as the species we hunt and continents we travel. Far from cliché, each hunter has a taste for key elements he or she believes best reflect their personal style and rekindle the emotions felt while pursuing allusive game. In addition to the taxidermy, there are textures, accents and themes that make a trophy room personal. These examples suggest there's no right or wrong way to choose decor, as long as the furnished space reflects the personality of its owner. Whether your game room is a few hundred square feet or several thousand square feet, before you outfit this meaningful space, determine your goals. Simply amassing foam and fur should not be the focus. A trophy room is a reflection of you, your taste, and your experiences. Tom Julian, president of Julian & Sons, has been designing and skillfully crafting custom game rooms for over twenty-five years. Julian has not only created some of the finest trophy rooms in North America, he also delivers annual seminars at Safari Club International and the Dallas Safari Club. These seminars reflect a passion that exceeds fine wood, raised panels and hand-rubbed finishes. Tom believes, "Each mount in the room represents a story. That story includes an adventure. This space represents much more than a wall full of dead animals. " No matter the size of the trophy room or the budget one has to work with, Tom suggests, "Make the space personal. This is a place to share epic adventures with family, friends and even non-hunters. If done tastefully, this space will be a room anyone can enjoy. A game room should be warm and inviting. A room that draws, is a focal point and one the entire family will congregate in." Saskatchewan native, Cam Barlow has been envied for his well-organized and functional trophy room. While his lair is not as large as some, Cam states, "I've tried to create a space that not only hunters will enjoy, but where people who don't necessarily enjoy the same passion will feel comfortable. I've had numerous non-hunters compliment me on the room being done in a tasteful way." Cam's goal meant creating a space that was not cluttered or overwhelming. "I find an overly cluttered trophy room can be distracting and take away from the overall feel of the room. I've also tried to break up the room into different focal areas rather than just mix everything together. For example, the main wall is my mule deer wall. There is another wall dedicated to just whitetails." Cam also incorporated a bookshelf to display hunting photos as well as his collection of first edition traditional archery books. "As life has become busy with small kids and work I haven't been able to find the time to get outdoors as much as I would like. I wanted a room where I could feel comfortable, relive some memories and bring some of the outdoors that I love indoors." Once you've identified the preferred elements and accents for your trophy room, hunt for inspiration within like spaces. Gather ideas, even photos, from sources such as Julian & Sons trophy room gallery, Log Home Living, home décor websites, Pinterest, or rustic furniture manufacturers websites. An exercise in inspiration doesn't mean you're replicating. Inspiration can come in many forms and is an ideal way to decide on exact color and specific décor. Compile your favorite ideas and map out your desired colors. When choosing the texture or color the animal will be mounted against, consider how to best accentuate the details, such as muscularity, antler or horn size. When it comes to color Tom Julian suggests, "Choose a neutral color to best accent the individual mounts. Wood has a strong personality and can actually be a distraction. A paneled wall or dark background can compete with the art or animal." Collating your favorite ideas found online or in magazines can help you visualize the look and style you desire. Whether you prefer the aesthetics of reclaimed wood, faux stone, barn beams, or lodgepole pine, these accents will provide the overall mood you wish to create. When outfitting your trophy room don't get in hurry. Its design should contain both form and function. Attaining the perfect balance will most likely take time and careful consideration. Done well, your trophy room will offer insight into the continents visited, the species hunted and the experiences you've accumulated. While arranging a lifetime of taxidermy into a single space comes with its challenges, accepting a 'less is more' mantra will serve to create a more visually appealing game room. Craig Boddington, Executive Field Editor of Petersen's HUNTING, offered a unique suggestion when arranging mounts. "Although I prefer to keep continents as separate as possible, I think it's fun to mix the small animals in with the larger animals. Behind the leopard I placed a royal antelope from Ghana, the world's smallest animal with hooves and horns." Boddington also has what some designers would formally call a "statement wall," a portion of a room, or an entire wall, displaying meaningful décor — or in this case meaningful taxidermy. "There is a corner in my little office with some important animals: My first grizzly, taken clear back in 1974; my first desert sheep, from Sonora in 2003; and my best pronghorn, taken in west Texas back in the 80s." No matter the size or score, these "important animals" make for rich conversation and hold special meaning to the hunter. "Statement walls" can also be arranged by family member, year of hunt, or most memorable experiences. Each wall within this space is a blank canvas. It's yours to create a focal point that is eye-catching, expressive and leaves a lasting impression. Often overlooked in the process of outfitting a trophy room is the small but noticeable details provided by art and furnishings. While some might envision these final touches costing thousands of dollars, they don't have to. Furnishings can come in the form of African artifacts, Navajo rugs, sporting art, antiquarian books, bookends and faux or genuine bronze sculptures. The more dollars spent usually means the more collectible the piece, but the same look and feel can be had though means such as eBay or Craigslist. Beyond the mounts on the wall, most hunters have a penchant for some type of collection. Fred Eichler collects old broadheads, whereas Jim Shockey collects art and artifacts of indigenous peoples. Whatever you enjoy, make it a part of your trophy room. Depending on the look and feel you wish to create; Western, African, rugged, or a more classic feel, antique shops such as Toll Gate Revival can provide inspiration along with additional décor for any style of trophy room. Not everything in a trophy room has to be new. Something as simple as a worn chesterfield or a rusty tin sign can add a finishing touch to the decor. Depending on the style of the space, some furniture may look more fitting with patina. A used leather sofa or chair could be the perfect addition to your space. Not everyone has a ten thousand square foot home to display trophies, but as hunters we can preserve memories while creating a space we enjoy spending time in. Ultimately it's your trophy room and yours to outfit as you choose. But this space is much more than 'just' a trophy room. As Tom Julian admonishes his audience at every seminar, "It's not the animal; it's the adventure."